Wishing you all a very happy Deepavali. May this festival of lights bring happiness and prosperity to you and your loved ones. I hope you all are having a wonderful time celebrating Diwali with your friends and family. As for us, it’s another working day with deadlines to meet and usual grind. So we are enjoying quite Diwali with long day at office and simple dal and rice for lunch and dinner :) These days by the time I reach home I feel physically and emotionally drained after staring long and hard at the jumble of codes on screen and breaking my head in trying to figure out that small bit of code responsible for creating havoc in the main system. No wonder I prefer to snuggle under the blanket with warm bowl of soup and toast than actually stand in front of stove for hours together cooking an elaborate meals for the festival. Ahem, it’s not like I used to cook elaborate meals before ;) No wonder weekends have become real luxuries for us and are spent either reading books or watching some movies and sleeping till noon. When it comes to kitchen part, we have been cooking very simple food these days and we have been cooking everything in bulk which lasts for 3-4 days. It helps a lot when you come home exhausted and want to eat some home cooked food immediately. I had no plans of cooking anything for Diwali this time. But somehow I got caught with the festival spirit while I talked to my Amma, Atte and sister who were busy making their menu for this festival of lights. I made up my mind to make something as long as it doesn’t exceed half an hour of cooking time and first thing that came to my mind was the sweet Appams that my mother makes. Last summer during our short trip to India, I had purchased the non-stick Appam pan which I had tucked on top shelf and it has been acquiring dust since then. With in a minute I washed and soaked two cups of rice in water for an hour and went on to finish few chapters from the novel I was reading. Then it was just the matter of using two poor looking bananas which were on the last stage of their life, a cup of powdered jaggery, few pinches of cardamoms to ground rice paste and voila, the smooth batter for Banana Appams was ready with in few minutes. With small ladle of batter poured on every hole of appam pan with a touch of Ghee for flavour, I was left with two dozens of small, sweet Banana Appams to enjoy for this Diwali. The aroma of sweet jaggery, bananas and cardamom wafting from my kitchen sure made me feel festive and transported me back to my home back in India. 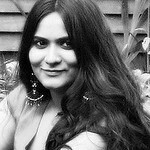 And off this goes to four events, Sweet Vegan hosted by Vaishali where Ghee can be substituted with oil, JFI-Festival Treats guest hosted by dear Valli, Sweet Celebrations at Aparna’s space where she is celebrating her first blog anniversary and WYF-Party Foods hosted by EC. Grind rice to smooth paste adding very little water in which it is soaked. Now add jaggery, grated coconut, bananas and cardamom powder, pinch of salt and pulse the mixer till all the ingredients blend well. Let this batter rest for at least 15 minutes for all the flavours to blend well before you proceed to next step. 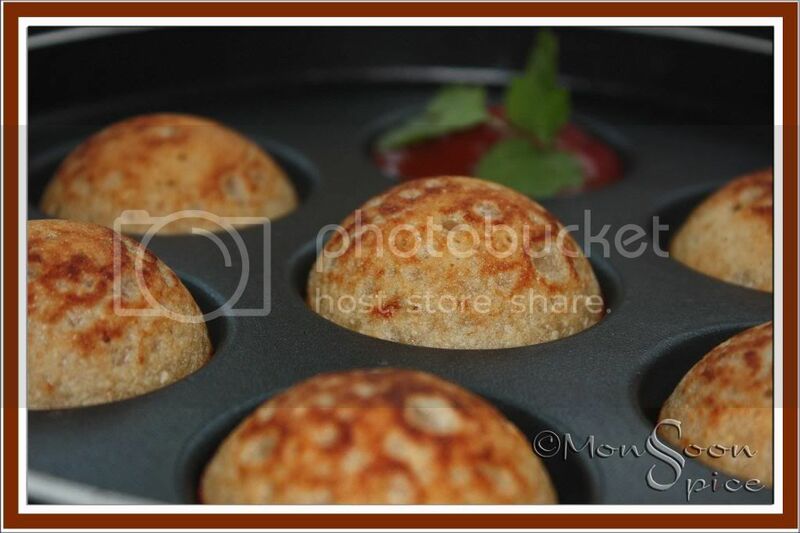 Now either you can deep fry or use Appam pan to make these Banana Appams. If using Appam pan, grease the Appam pan with little ghee and heat it on medium flame. Pour the batter into each hole and cover the pan with a lid and let it cook on low-medium heat on both sides till it turns golden brown and cooked through. Serve it hot with any spicy Chutney or hot Tomato Ketchup or as it is and enjoy. If deep frying, make sure the paste is thicker. And if using Appam pan, the batter can be little thinner, of pancake consistency. I used non-stick Appam pan and it hardly required any oil of ghee due to coconut used which releases its natural oil when cooked. If using iron pan, make sure that you grease it properly. Kitchen is 3/4 done, but will not be available for me to cook tomorrow. I will make Microwave badami burfi, that's it. Well..got to go, dental appointment for us today. Hugs, bye. I've put this down in my list of things to get(the non-stick appam pan, that is) when I go in December. Dear Sia, Those appams are just gorgeous! Thanks for this beautiful entry. I always have bananas around the house so I have to try these soon. Have a very lovely Diwali. Happy Deepavali! Sia. Sweet Appams are a perfect way to celebrate Deepavali. I did not realize they were this easy to make, they look so good. Hi Sups!!! Lovely Appams and hey happy diwali to you n family!!! Wish you and your family a very happy Diwali Sia. This post came at right time. I have two bananas which are very ripe and i was feeling bad to throw them out. I can't eat them as it is. I will try these tomorrow. Wish you and your family a Wonderful Diwali Looks fabulous ur appam! yuumy! what else can i say?? 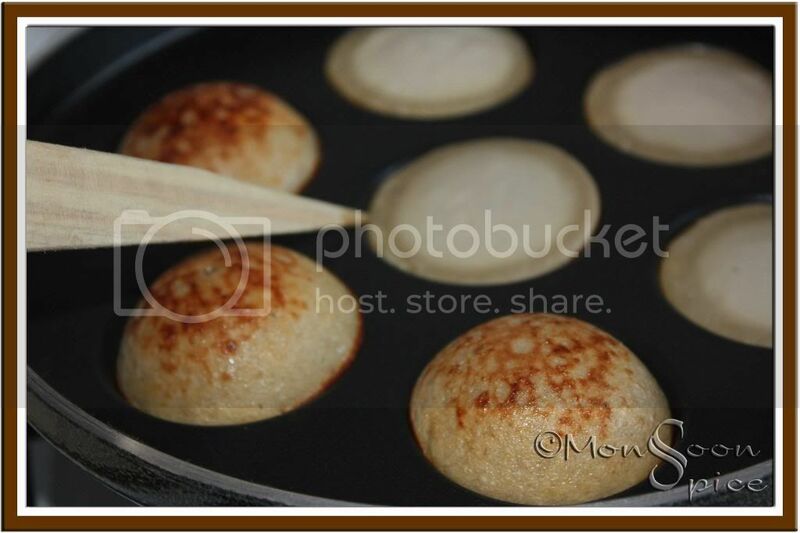 i want the apam maker..
beautiful looking appams Sia. I usually make it with wheat flour and bananas.. they come out well. Happy Diwali to Sia. What a wonderful banana appam u made. Looks so gorgeous. Can I have one pls? I only know this to deep fry. I've to try it with appam pan. Ur pictures are drooling! Diwali wishes to you and Krish, dear Sia. Hi Sia, wishing you a Very Happy Diwali. The appams look very cute. Those look too good! I will have to make do with drooling right now, Poor me! Don't own an appam pan. These pictures look good enough to eat. I'm yet to turn out special treats. Have a fantastic Diwali! I never knew there's banana appam. Looks good but i dont know what jaggery is. I dont have appam mould either. ANy other way of making it? Wishing you and ur family HAPPY DIWALI...!!! Hope this festival of lights enriches your life with joy & happiness. BTW, ur Banana Appam look gr8. Wow that looks yum Sia..wish you and your family a happy Deepavali..
anudivya, as i have mentioned in the notes, u can deep fry them if you don't own appam pan. but make the batter lot thicker for that. Salt N Turmeric, jaggery is unrefined palm sugar. u can replace it with simple sugar of brown sugar. and if you don't have appam pans you can simply deep fry them. but make sure that the paste is bit more thicker, as in for fritters. great idea for Diwali! Happy Diwali to you and your family. Happy Deepavali Sia to U an ur Family !! 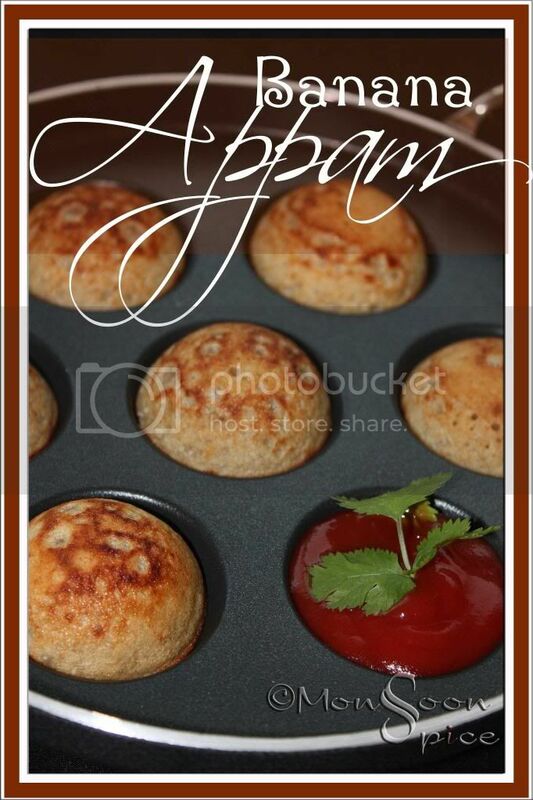 Appam looks wonderfull.. Nice snaps !! Wishing you a Fabulous Diwali Greeting! 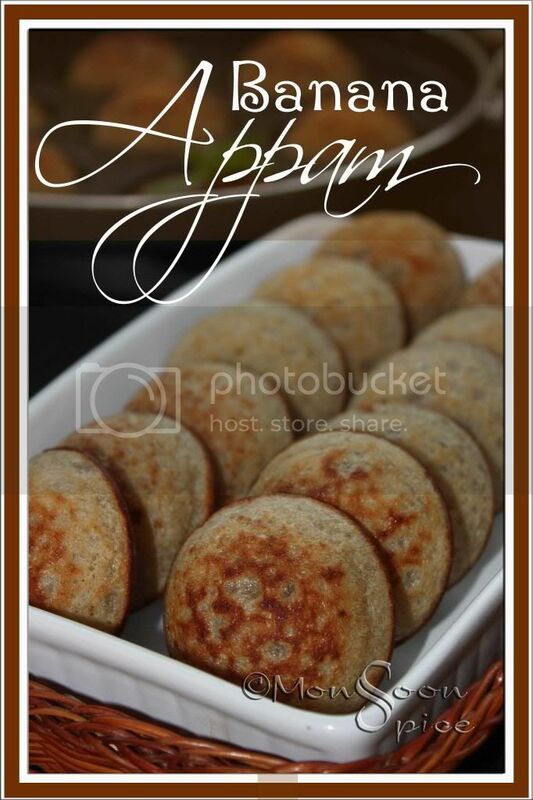 Beautiful appams - looks like a pretty simple recipe. And we have a "appae kayli" so we should make this more often. Happy Deepavali, Sia! I would try making this without the bananas. Do you think the texture would be affected much? Thanks you, Sia for joining me in celebrating with these delicious "Neiyappam". Happy Diwali Sia. The banana appams look great. I took a low key approach this year as well. I usually invite people over but this year I took a pass. Still made tons of mithai and we are still stuffing our faces! Hey, you gotta celebrate Diwali one way or another, right?.